For months now, we are seeing events showing how desperate the Nazionists really are. Things might go to their worst before we can see the proverbial light at the end of the tunnel. Days ago, we’ve read that US was deploying 3 B52 Stratofortress strategic bombers to UK. 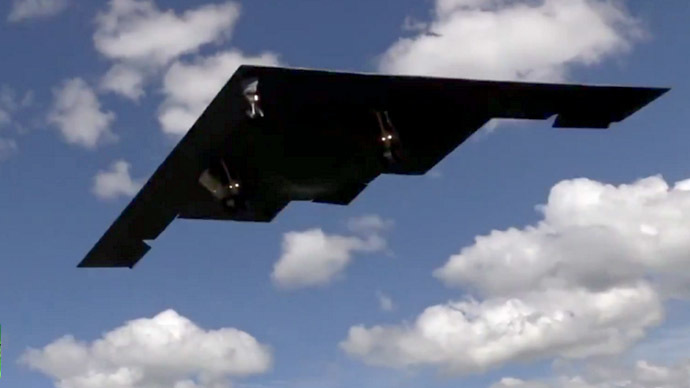 Now, it’s deploying its Stealth B-2 Bombers in Europe. NATO war games and other saber rattling were also conducted, or are still in progress. They’re down to their last card. But these moves only work for kids. Most people are not afraid anymore. They are angry. The few Arrogants still clinging to power acquired by force and deceit, they will all be going down hard. 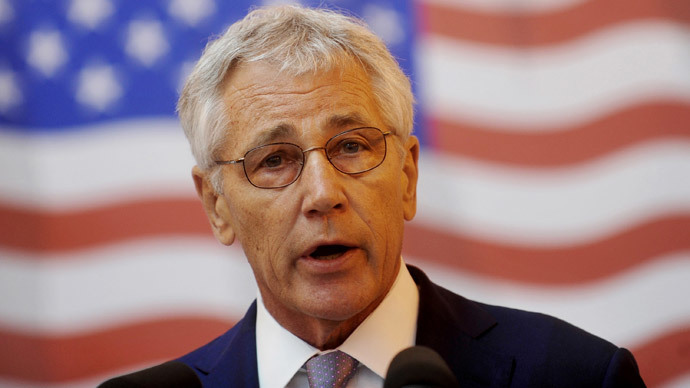 Following President Obama’s commitment of $1 billion to expand NATO’s role in Eastern Europe, Defense Secretary Chuck Hagel announced on Thursday that the United States will be bolstering its presence in the Black Sea region. Hagel is currently swinging through Romania, a NATO member that has urged the US to increase its presence in Eastern Europe in the wake of the Ukraine conflict and Russia’s accession of Crimea. Since then, the country has been a part of joint military exercises with American forces and has promised to increase its own defense spending. According to Reuters, Hagel said President Obama’s $1 billion fund would allow for a “stronger presence of U.S. ships in the Black Sea,” and that the plan would mean a consistent stream of rotating vessels in the region. “We will sustain that tempo going forward,” he added. At the time of Hagel’s comments, he was touring a guided missile cruiser, the US Navy’s Vella Gulf, which has been stationed in the Black Sea for about two weeks. It is the fourth American ship to move through the region since tensions with Russia increased, with the US hoping its deployment reassures European allies regarding its obligation to defend them. “The Vella Gulf is a clear representation of America’s commitment to security in the region,” Hagel said, according to the AP. The comments come just one day after Obama spoke in Poland and pledged $1 billion to expand its military role in Eastern Europe. As RT reported, the president said more troops would begin rotating through the region, and that the US would help fund and train military forces of NATO allies. While the plan earned the praise of Polish President Bronislaw Komorowski, Russia criticized NATO for boosting its presence near its borders and argued the group is also responsible for unrest in Ukraine. “NATO is providing Kiev – a member of its Partnership for Peace program – with technical assistance, thus encouraging the prolongation of its use of force. Thus the Alliance accepts a part of the responsibility for the escalation of the situation, and the collapse of diplomatic negotiations,” said Aleksandr Grushko, Russia’s envoy to NATO. The US Air Force has sent more of its bombers to Europe, deploying two B-2 stealth aircraft as part of a military exercise. On Sunday they joined three B-52 StratoFortress bombers already deployed in Britain. All the visiting American aircraft are stationed at RAF Fairford, a British air base west of London. The B-2 bombers are assigned to the 509th Bomb Wing out of Whiteman Air Force Base, Missouri. They will conduct training flights in the US European Command area of operations, the statement said, offering no further details on the mission. The US has been sending additional troops to Europe lately in a gesture meant to reassure its NATO partners, especially those in Eastern Europe, that Washington is committed to defending them militarily. NATO says the deployments are needed for a possible aggression from Russia amid the ongoing political crisis in Ukraine. Moscow is criticizing the buildup of NATO forces close to Russia’s borders, calling them provocative and warning that the US is using the Ukrainian events as a pretext to flex its muscles. The Northrop Grumman B-2 Spirit is a multipurpose stealth bomber first used by the US during the 1999 war in Kosovo. It was designed primarily to deliver nuclear weapons, but has been used extensively as a conventional bomber in all major US military campaigns from Afghanistan to Libya. 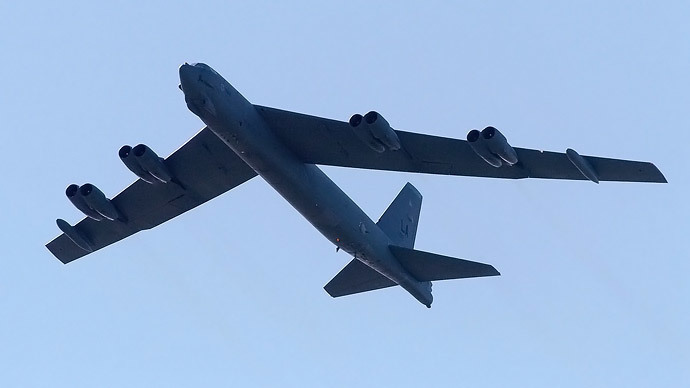 Three B-52 Stratofortress bombers have landed at Royal Air Force Fairford, England, for a two-week deployment to “become familiar with airbases and operations in the region.” One of the planes is set to take part in D-Day celebrations in Normandy. The bombers that have crossed Atlantic have come from two locations: two from Barksdale Air Force Base in Louisiana and one from Minot Air Force Base in North Dakota. All aircraft have arrived in the UK unarmed. Though the ultimate destination of the B-52s has not been mentioned, it is most likely they will take part in the Baltops maritime exercise of 13 Baltic Sea region nations (beginning on June 6) and Saber Strike 2014, a US-Europe security cooperation exercise also conducted on the territory of three Baltic states (already underway, June 3-14). Also during the deployment to Fairford, on June 7 one of the Stratofortresses will take part in celebrating the 70th anniversary D-Day commemoration in France’s Graignes, where leaders of the WWII Allies will flock, also to discuss the present political situation in Europe. The B-52 Stratofortress strategic multirole subsonic bomber was designed as a powerful tool of nuclear deterrence, armed with nuclear bombs and cruise missiles with nuclear warheads. It can also perform conventional missions of air support using high-precision GPS and laser-guided bombs and conducing search and rescue and also tactical maritime operations. The development of NATO was based on the CIA-BND fraud that Russian officials had plans to invade Germany via the “Fulda GAP”. Former WWII, NAZI general Reinhard Gehlin initiated the rumor from the Pullach HQ of the Bundes Nachrichten Dienst about 1948-1949. The pre-CIA war-mongers in the US, e.g. OSS-OSI and the Dulles Brothers, returned Gehlin to his NAZI spy HQ in Pullach, suburb of Munich, which he converted into the Bundes Nachrichten Dienst (BND), the extension office in Germany of the CIA. The BND remained in the WWII NAZI spy HQ in Pullach until 2014, when a move to a new HQ complex in Berlin was initiated. The fraud of “Fulda Gap” disappeared with the “fall of the wall”, 1989, that separated E. Germany from W. Germany. Meanwhile, available evidence indicates that leaders of Russia had no plans to invade Germany or Europe. The “Fulda Gap” episode was a means of maintaining a hostile stance against Russian ledership, that enabled continued arms production and continued profits to owners of the armament industry. The fraud lasted 40 years.